Overlooking the Gulf of Trieste, Muggia is the last piece of Istria still in Italian territory, after the Treaty of Paris of 1947, the Treaty of London of 1954 and the Treaty of Osimo of 1975. The Istria white stones and the colorful houses form an unique contest with the verdant karst hills. Although the first documents about the origin of the village date back to the XI century, when a small center, called Borgolauro, was founded in the valley, the discovery of important archaeological remains, in the upper part of the promontory, revealed the presence of two prehistoric forts (Santa Barbara and Muggia Vecchia), dating back to the Bronze Age. After the fall of the Roman Empire, Muggia was subjected first to the Patriarchate of Aquileia and, then, to the Venetian Republic until 1797. After the Napoleonic interlude, it became part of the Austro-Hungarian Empire until the end of the First World War, when it was annexed to the Italian Kingdom. - Muggia Vecchia Archaeological Park, where it is still possible to admire the ruins of the ancient "castrum", the city walls and gates, the houses and streets. 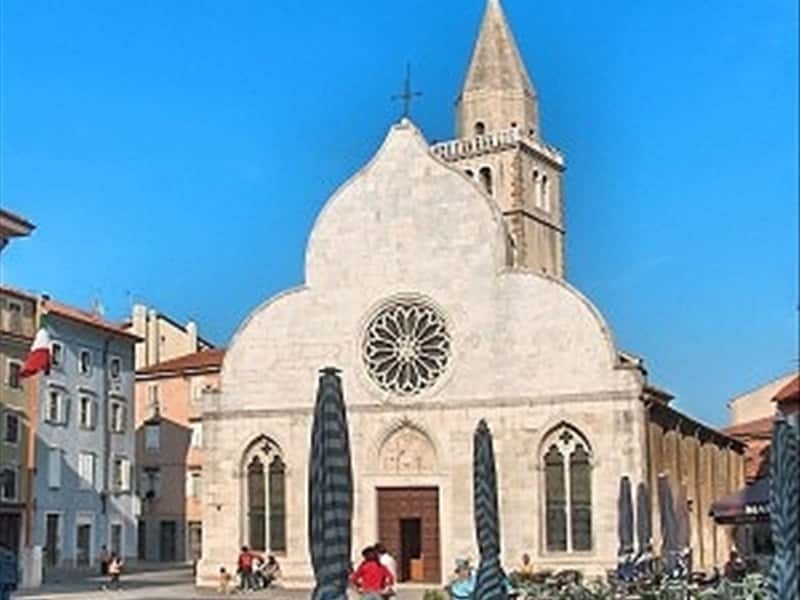 - the Cathedral of the Saints Giovanni and Paolo, of Romanesque style origin, has now a Venetian-Gothic style after the restoration of the XV century, when the façade was covered with slabs of white stones. The façade features a magnificent rose window with an image of Our Lady with the Child; it is divided into three naves and remains of XIV century frescoes are still visible. - the Romanesque style Basilica of Santa Maria Assunta, divided into three naves, is what remains of the primitive village of Castrum Muglae. It recalls a pre-Romanesque style of the X century. This town web page has been visited 18,205 times.